LumberMan - MN 26 - Portable Sawmills - Portable Sawmill by Norwood Sawmills Inc. The zero-compromise sawmill … Powerful, Reliable & Affordable –Built for Hobbyists who take Pride in their Work. Buying a full-size sawmill? Here are some hard facts to think about: The LumberMan MN26 can handle logs up to an impressive 26” in diameter (65cm) and mill boards up to 17” wide (42.5cm). The backbone of any sawmill is its sawhead. The MN26 boasts the same patented laminated sawhead that’s the foundation of all Norwood bandmills – the proven durable design that can withstand the everyday rigors of heavy milling. It's not enough for the LumberMan to be able to just handle logs bigger across than oil barrels. You’ve got to maximize cuts per hour. Which is why the LumberMan MN26 is engineered to mill with faster cycle-times using patented Norwood sawmill technology like auto-locking sawhead and available optional auto-lube. That’s what it means to be a Norwood – Tough on the outside. Smart on the inside. No two jobs are the same. That’s why Norwood offers so many options to help get all those jobs done, from available towing package to the available log loading and rolling system that saves you time and sweat. How can you put your stamp on your LumberMan MN26? Count the ways. Norwood engineered the MN26 to accept every capacity-boosting attachment built for the LumberMate LM29. Check them out in the Manual Options! Blade-Lube System – Standard-equipped blade lubrication helps keep blades pitch-free. Available optional auto-lube system automatically turns water on and off each cut. Heavy-Duty Clutch – Heavy-duty centrifugal clutch safely engages the blade when you depress the push-handle-mounted throttle lever. Log-Clamps – Dual vertical-adjust, 3-function log rests optimize clamping of saw-logs, cants and boards. Also included is a screw-crank log-dog as standard equipment. Solid Frame – Rigid 4-post carriage delivers superior stability and performance over torsionally weaker 2-post or cantilevered systems. Blade-Guides – Dual fixed precision-machined and hardened blade guides support cuts as wide as 17” (42.5cm). Leveling-Feet – For perfect log-deck alignment, the LumberMan has available optional ten micro-adjust leveling feet. 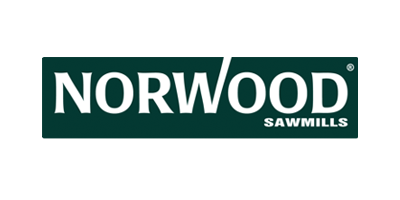 The Norwood LumberMan MN26 portable band sawmill (http://bit.ly/1kOdcAS) mills logs up to 26" (66cm) in diameter into boards up to 21" (53cm) wide. No reviews were found for LumberMan - Model MN 26 - Portable Sawmill. Be the first to review!